The night started with Chimp Spanner, a band who are fast making a name for themselves and who I was looking forward to hearing. The first surprise for many people is that they are an instrumental band. The second surprise is just how good they really are. Musically tonight they were superb - some really impressive music, but the lack of vocals meant that after three or four songs I was starting to get a little bored. It's not that the music is boring - far from it, I just find instrumentals less enjoyable normally than music with vocals. It was great but it just didnt feel right on a tour like tonights. If they were playing mid afternoon at a festival that would be great - it's the sort of music that is just perfect for enjoying while relaxing in the sun with a few beers - it's a metal fans perfect chill-out music. Next up were Devil Sold His Soul. They were much louder and heavier than Chimp Spanner, and were on paper a great band to get the crowd warmed up for Sylosis. In reality however...Oh dear. They really didn't win the crowd over tonight despite putting in an energetic performance. A few shouts for Sylosis were heard between songs, and the crowd at the barrier looked pretty bored. Speaking to fans after their set I wasn't able to find a single one who had enjoyed their set, so it wasn't just me who was pretty underwhelmed by them. Thankfully next up came Sylosis. The young band from Reading have been going from strength to strength over the last few years, and have been great every time I've seen them play. Unsurprisingly tracks from their new album "Monolith" make up a significant part of the setlist, with five songs from the album making an appearance tonight. Right from the start they played the new material, opening with "Out from below" and then "Fear the world". I thought they sounded great, and the crowd clearly agreed judging by their reactions, and it's not surprising - Sylosis are a great live band. 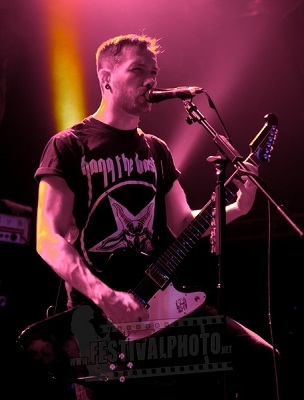 Great performances from Sylosis and Chimp Spanner, making it a good night for metal fans.